Browsing slow cooker recipes? 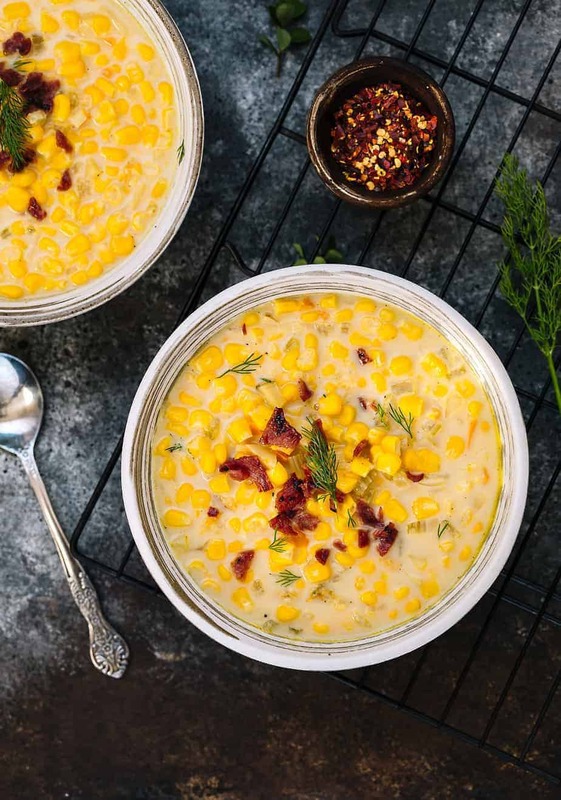 Try this creamy corn chowder with some fresh and healthy ingredients: corn, potato, celery, bell pepper and white onion. This is a lighter version of those “classic comfort food” corn chowder recipes. I skipped the heavy cream cheese and replaced it with 2% milk (you can also use whole milk for richer texture). Atop the soup is a healthier alternative, with all natural and nitrate free turkey bacon. Slow cooker recipes are so convenient, I just throw all of the ingredients into the pot and for the most part walk away. The short preparation time gives so much more time to my day. Check out more slow cooker recipes from our page. In a large saucepan over low-medium heat, melt the butter. Add the onion, bell pepper, celery and potato. Cook and keep stirring until the vegetables start to soften and the onions are translucent. Remove from the heat and transfer into the crock pot. Add 12 oz of corn kernels, chicken broth, bay leaf, salt, black pepper into the crockpot. Using a blender, puree the remaining 12 oz of corn kernels and milk. Stir the mixture into the crockpot. Cook in low heat for 7-8 hours or high heat for 4-5 hours. Season with salt/pepper if needed, add/or the optional poultry seasoning. Serve with crispy cooked and crumbled turkey bacon. I love using my slow cooker on super busy hockey nights and I love a good corn chowder. This would be a perfect recipe to try on a cold weeknight! Looks delicious and simple too! Thank you so much for sharing it! This weekend will be the perfect time to make your creamy corn chowder. It’s supposed to be cold here in the south this weekend and I love a good bowl of chowder on a cold day. It looks delicious! We enjoy a good corn chowder but we like ours more creamier, less chucks of corn. Combine with a toss salad and some homemade bread all set. I absolutely love corn chowder but I forgot about it for years. I cannot wait to try this! It looks so good. Yum! I love corn chowder but I’ve never tried making it myself. It always looks like a hard to make but this recipe makes it seem easier with the slowcooker! Oh my gosh, you had me at corn chowder! So many people I know love their slow cooker, I’ve got to get one and try some of these recipes out for myself! i love corn chowder but I haven’t made it in ages. This sounds like a really yummy recipe for it. Another reason to love my slow cooker. Your corn chowder looks awesome! I would rather use regular bacon instead of turkey bacon though. I am sure it will still turn out delicious. We are dipping back into winter weather this weekend here in Indiana. This soup sounds like just the thing for dinner! Love bacon. Love your directions and photos so easy to understand. I have never been a big fan of chowders, but this one looks quite tasty. I would actually like to try this one. Great recipe! That Slow Cooker Creamy Corn Chowder looks so delicious! I have really been into slow cooker recipes lately and I can’t wait to try this. Slow cooker recipes are getting more and more popular and it’s awesome because it makes cooking so convenient especially for busy weeks! 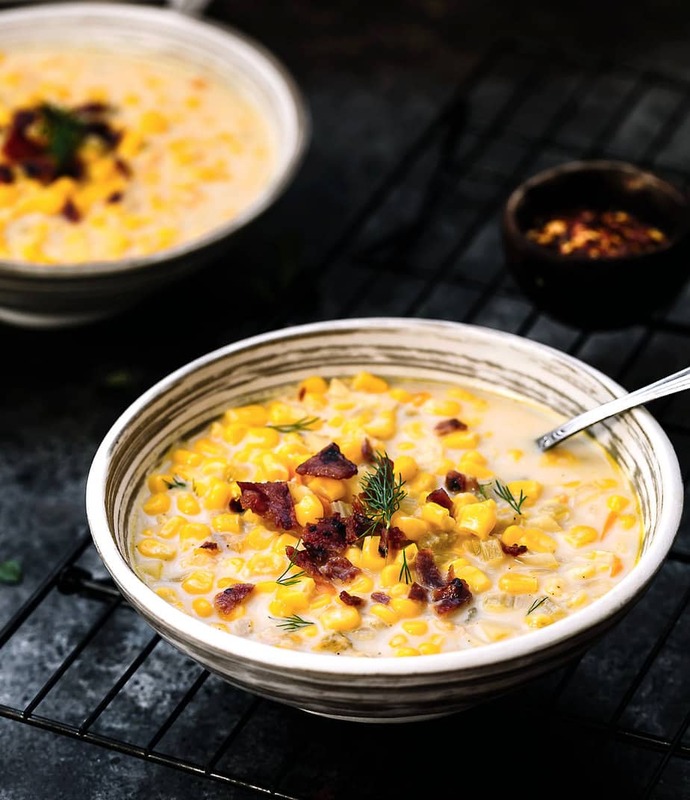 I think this corn chowder sounds amazing! I must try it!